I Burn Paris has remained one of Poland's most uncomfortable masterstrokes of literature since its initial and controversial serialization by Henri Barbusse in 1928 in L'Humanité (for which Jasieński was deported for disseminating subversive literature). It tells the story of a disgruntled factory worker who, finding himself on the streets, takes the opportunity to poison Paris's water supply. With the deaths piling up, we encounter Chinese communists, rabbis, disillusioned scientists, embittered Russian émigrés, French communards and royalists, American millionaires and a host of others as the city sections off into ethnic enclaves and everyone plots their route of escape. At the heart of the cosmopolitan city is a deep-rooted xenophobia and hatred — the one thread that binds all these groups together. As Paris is brought to ruin, Jasienski issues a rallying cry to the downtrodden of the world, mixing strains of "The Internationale" with a broadcast of popular music. With its montage strategies reminiscent of early avant-garde cinema and fist-to-the-gut metaphors, I Burn Paris has lost none of its vitality and vigor. Ruthlessly dissecting various utopian fantasies, Jasienski is out to disorient, and he has a seemingly limitless ability to transform the Parisian landscape into the product of disease-addled minds. An exquisite example of literary Futurism and Catastrophism, the novel presents a filthy, degenerated world where factories and machines have replaced the human and economic relationships have turned just about everyone into a prostitute. Yet rather than cliché and simplistic propaganda, there is an immediacy to the writing, and the modern metropolis is starkly depicted as only superficially cosmopolitan, as hostile and animalistic at its core. This English translation of I Burn Paris fills a major gap in the availability of works from the interwar Polish avant-garde, an artistic phenomenon receiving growing attention with recent publications such as Caviar and Ashes. I Burn Paris is full of wonderful, often moving, minor portraits; and this is, I believe, its greatest strength. ‘You cannot feel concern for everyone,’ Jasieński writes at one point, and yet his own work goes some way to disproving this statement. Switching between decadence, futurism, manifesto, propaganda and remembering that this was written between two World Wars and prior to the Great Depression this is a revolutionary work. Yes, a deeply political work, references to Karl Marx are not uncommon, and as a result it is no surprise to learn that it was met with uproar, the obvious political leanings of our author and the majority of the action taking place in dark settings or at night, we have the shadows pervading people’s lives. A capitalist system in decline, a dystopian future with utopia an elusive, but realistic possibility, this work is thoroughly recommended. The poetic, rhythmic descriptions of a Paris beyond salvation and twisted by the damaged psyche of the protagonist demonstrates a masterful control of the written word and an ability to make even the most mundane, the most brutal and the most industrialised scenery seem beautiful. Jasieński transforms human interaction into dreamscapes, into angst-ridden rides that unsettle the reader almost as much as the characters themselves. [...] With beautiful lucidity, it depicted a world where madness is systemic, encouraged, and cultivated to imprison us all. But this great work remains largely uncelebrated. 85 years after its initial publication, I Burn Paris should not be feared, but rather embraced and placed alongside other classic metropolitan nightmares. It has now been translated to reach a wider audience – one that is more politically informed, and perhaps ready to see past the politics and embrace Jasieński, Poland’s great Futurist artist. When today communism is often figured in terms of contagion, resonance and transmission between living bodies, Jasieński’s novel makes uncomfortably resonant reading. Jasieński’s apocalyptic vanguardism sees catastrophe as clearing the way for organisation and the plan. … [His] dialectic of rotting dispersion and tailored compactness traces a fantasy space in which, too often, we still dwell. This novel is on a par with the ruthless dissection of utopian ideals found in any Orwell, Burgess or Huxley, yet because of its late translation it has never been granted with their fame – almost lost to obsolescence. This wonderful book only exists because of its materiality – its publication from a physical manuscript to a concrete printed word made literal and hold-able. I Burn Paris is a masterful work of art, superbly translated (as far as I can witness) from the 1929 Polish edition by Soren A. Gauger and Marcin Piekoszewski, and attractively published by the small but acute Twisted Spoon Press of Prague. The translation ... appears in a moment when materialism and avarice are at their zenith, social unrest is spanning continents, and the disparity of wealth is at its largest point since, well, the original publication of I Burn Paris that saw Polish émigré author Bruno Jasieński escorted to the French-German boarder and warned not to return. The story is at once pertinent and far-fetched. For the economic and classist woes besieging Paris in the novel are equally prevalent today. Factories are closing, the gap between rich and poor widening, and thousands of honest workers discover themselves unemployed and overdebted, making I Burn Paris an accessible and relevant read despite the eighty years distance between author and reader. 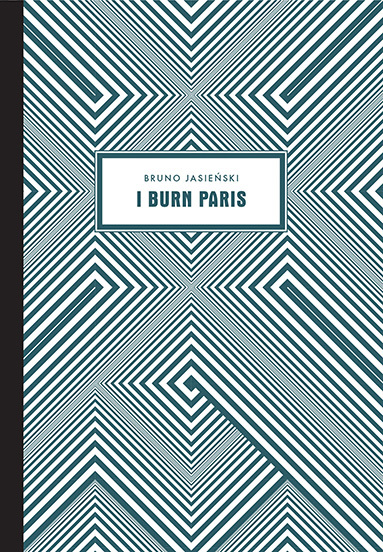 While much has by now been written about the relationship between the avant-garde and Stalinist literature, Jasieński's I Burn Paris reveals a still largely forgotten moment: post-avant-garde and pre-Socialist Realist. Aesthetically, the moment was a fantastical one: quasi-Surrealist, hallucinogenic, and grotesque. I Burn Paris is clearly a modern novel, in the sense of the modernism of the 1920s. It's not hard to imagine why it would have made Jasieński a villain in Paris and a hero in Russia. But the novel has aged well and maintains its uncanny point of view and shocking sensibility. It is a vital addition to Central European literature in English. However you read it, though, it’s a fascinating text, and it’s a real shame it was left untranslated for so long. Kudos, as always, to Twisted Spoon, for a nice save and a very classy hardback. Hidden from English readers for over eight decades, the novel is perhaps Twisted Spoon’s bravest publication to date. The idea that a people in the heart of Europe might be cut off from help and hung out to dry while they deal on their own with some kind of raging infection that might otherwise spread to the rest of the continent destroying economy after economy in a domino effect obviously has no place in modern, twenty-first century Europe, though if you happen to be suffering from “internal devaluation” brought on by the black debt you might beg to differ. Jasieński’s language can be hypnotic at times as the reader has to decipher familiar things described in an absurd or bizarre manner as details in a world where the individual is of no concern to those in power. ... The fantastic and bizarre that Jasieński describes, both in subject and description, makes for a thoughtful, disturbing read. Jasienski's novel is, after all, primarily a fantastical one, combining the two most critical elements of social literature in those restless times: Catastrophism and the belief in a miracle — in this case, the miracle of the Revolution. ... We are affected by this visionary fantasy with the extreme, sometimes even brutal realism of its texture, its innovative literary form, and the ambitious courage of its concept. Above all, however, the novel grips us with its eternal — forever old and forever new — story of the human heart that dreams of a better tomorrow.